The name of the eggplant is said to come from the resemblance of some 18th century European varieties to hen's eggs: the fruits were pale in color, and smaller and rounder than the classic tear-drop Italian eggplant or the elongated, slender Japanese eggplant. 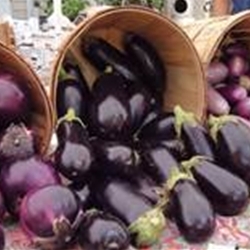 Eggplants come in many different colors and sizes. Excellent for eggplant parmesan! All plants are certified organic. Available in a 4 inch cowpot. Select here for transplant information, pick up and order dates. Classic Italian eggplant with high yields and no spines. Blocky, nearly black bell shaped fruits have a slight signature ribbing. Medium to thick skin is deep purple and glossy when mature. Compact plants benefit from staking to support heavy yields of large fruit.